It was a very, very close vote. So close that we have decided to give the six who didn't make it a chance to make the team through publications. More information on that will be e-mailed to the contestants later today. You should all be proud of the stellar work you have created - you are all amazing! We would like to thank everyone who submitted to our design team call. The entries were phenomenal and so very hard to choose from. We will be sending an e-mail to each finalist later today with directions on what to expect in the next step, the Amazing Race! Congratulations and good luck! Check back soon for a look at our finalists’ entries and for more details on our Amazing Race! Each image should not exceed 500K. All 8 images should all be included in ONE email with your name in the subject line. Submit your entries to amazingrace@rustypickle.com. The deadline for entry remains the same - Sunday May 31st at 12 noon Mountain Standard time. Hope that clears up some confusion! Please let us know if you have any further questions. We can't wait to see your entries! RUSTY PICKLE DESIGN TEAM CALL! Good news! Rusty Pickle is looking to expand our elite design team! Ten finalists will be chosen to run an "amazing race" where their talent (and ability to function on minimal sleep ;)) will be put to the test. Of these ten finalists, five will be chosen to join the Rusty Pickle team. The deadline for entry is Sunday May 31st at 12 noon Mountain Standard time. Please submit the following 3 projects for consideration: (1) 2-page 12x12 layout, an altered project and a mini album 8x8 or smaller with at least 6 pages. Projects must contain 100% Rusty Pickle product to qualify. Email all entries to: amazingrace@rustypickle.com. Please limit one email per contestant with 1 project image of the layout, 1 project image of the altered project and six images of the album. Each image is to be no more than 500K in size. In the subject line put only your name. The ten finalists will be announced Friday, June 5th at 12 noon. 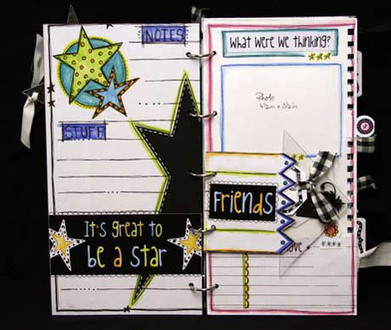 *Clarification on the 100% Rusty Pickle Product requirement* You can use paint, ink, thread, pens, cardstock, etc. Just make sure if RP makes a version of something, you use that. For example, Rusty Pickle makes bling, so use that instead of another manufacturer's. Rusty Pickle does not manufacture paint, glimmer mist, ink, thread, pens, etc. 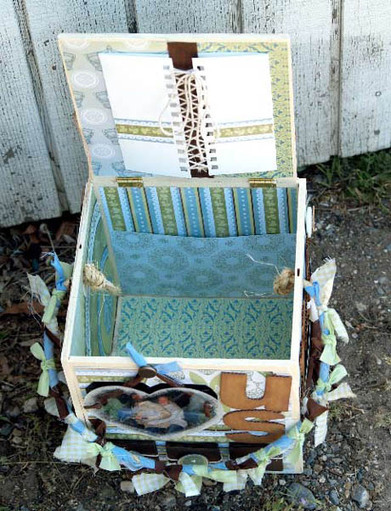 so you are okay to use those items on your projects. 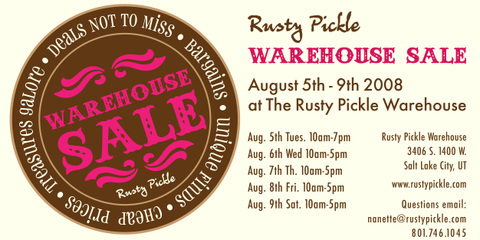 Rusty Pickle Warehouse Sale This Week! That's right, all week long, tons of product will be ON SALE at our warehouse in Utah! This offer is only available in person at our warehouse! If you live in the area or are planning a trip, be sure to come check us out- you will NOT want to miss deals galore! And if that weren't enough, we will also have our famous CHOCOLATE FOUNTAIN running with ooey gooey chocolate to fill up your tummies while you shop; eat your heart out while you shop your heart out! Drawings, tons of prizes and even classes from LANCE! Bring a girlfriend and make a day of it. You'll be sure to walk away with loads of bargains and a cool technique or two to help you use up those great products! That's right, the first week in August, tons of product will be ON SALE at our warehouse in Utah! This offer is only available in person at our warehouse! If you live in the area or are planning a trip, be sure to come check us out- you will NOT want to miss deals galore! And if that weren't enough, we will also have our famous CHOCOLATE FOUNTAIN running with ooey gooey chocolate to fill up your tummies while you shop; eat your heart out while you shop your heart out! Drawings, tons of prizes and even classes from LANCE! Bring a girlfriend and make a day of it. You'll be sure to walk away with loads of bargains and a cool technique or two to help you use up those great products! Yep, Mr. Pickle himself we be in town this week teaching at several stores in the area! If you are from the Chicago region or are in town for CHA, you won't want to miss this awesome opportunity to take a Rusty Pickle class from Lance!